Mitt Romney's family history has some interesting facts that tie in with the evolution of Mormons in the U.S. and with U.S. politics. Mitt's great-grandfather, Miles Park Romney, originally had five wives, although one eventually left him and the church. Overall, Romney's family tree contains six polygamous men with forty-one wives. Mitt's father, George W. Romney, served three terms as Governor of Michigan and also became the U.S. Secretary of Housing and Urban Development under President Nixon. Mitt Romney's mother, Lenore, ran for a Senate seat for Michigan, but lost to the incumbent in 1970. Lenore was pursuing a promising acting career in Hollywood when she met George. She decided to give it up when they got married and stayed home to raise two sons, Mitt and Scott. Mitt Romney met his future bride, Ann Davies, in elementary school, where the mischievous Mitt would throw pebbles at Ann as she rode by on a horse. Although the romance stalled in elementary school, they met again through mutual friends, and they married in 1969 and had five sons. Now they enjoy spending time with their 16 grandchildren. 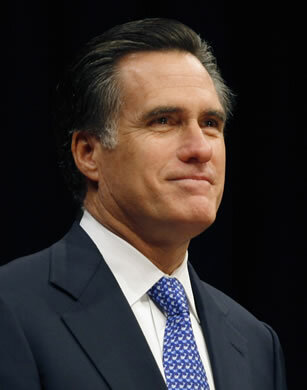 Delving back into the Romney family tree, the Pratt family became connected with the Romney family through Mitt's grandfather, Gaskall Romney, who married Anna Amelia Pratt. The Pratt family was early colonial settlers in America in the 1600s, and several prominent family members were involved in the Mormon movement during the 1800s. Parley Parker Pratt, born in 1807, was an early leader Latter Day Saint movement and was a poet, missionary, editor of the Latter-day Saints' Millennial Star, and he surveyed and built the first road designated for public transportation in Salt Lake City. It's called Parley's Canyon and can be visited today. Unfortunately, Parley was murdered in 1857. Mitt's great-great-grandmother, Sarah Marinda Bates Pratt, born in 1817, was the first wife of Parley's brother Orson Pratt, a prominent Mormon and polygamist. Sarah abhorred polygamy and started the Anti-Polygamy Society in Salt Lake City. Helaman Pratt, born in 1846 in a covered wagon on the Mormon Trail near Iowa and the son of Parley Pratt, is the great-grandfather of Mitt Romney. Helaman helped bring the Church of Jesus Christ of Latter-day Saints to Mexico and helped perform the first Mormon baptisms in Mexico. Helaman served as the Mexican Mission's president during the 1880s. Part of the reason Mexico was chosen by Helaman was because the U.S. began to censure polygamists, causing many to flee. Another relative, John Thomas Caine, related by marriage to the Pratt family, was heavily involved in politics during the nineteenth and early twentieth centuries. He began as a delegate to the Utah State Constitutional Convention and then became a member of the Utah territorial council, followed by becoming a delegate to the U.S. Congress for the Utah Territory from 1882 through 1893 and finished with a run in the Utah State Senate. John Caine attempted to run for Governor of Utah, but was defeated. Mitt's father, George Romney, never finished college and rose up from very humble beginnings as an apprentice to a plaster and lath carpenter and then as a salesman of aluminum paint to end up CEO of the American Motors Corporation before becoming Governor of Michigan. Although Mitt's family history is filled with accomplishments and noted ancestors, he has faced problems when his wife, Ann, developed multiple sclerosis in the late 1990s and then was diagnosed with breast cancer, which she has so far fought successfully with her family's support. Mitt's family history is filled with religious and political leanings, as well as the business acumen developed by George Romney and passed down to Mitt, that have positively impacted his career in the private sector and in politics.